The Master of Suspense, Alfred Hitchcock, hits another bullseye with his 1956 production of The Man Who Knew Too Much. 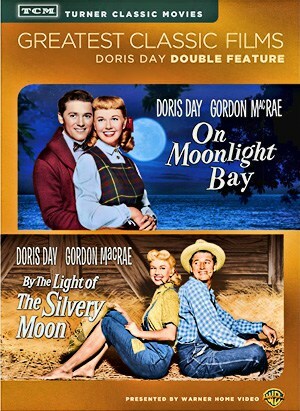 Purists have been known to complain that they prefer Hitchcock’s original 1934 version of the story to the lavish, widescreen, color version starring James Stewart and Doris Day, but if viewed side by side, both films stand on their own as classic Hitchcock. The 1956 version of The Man Who Knew Too Much unfolds like a beautiful book, methodically, deliberately, and compellingly. Stewart plays an American doctor and Day is his wife, a retired singer. They are vacationing with their young son, Hank, in Morocco, when they become embroiled in an international incident involving a planned assassination. Their son is kidnapped and taken to London. Day and Stewart follow and attempt to get some answers and to locate their son, on their own, without the help offered by Scotland Yard. The film reaches its exciting climax during a concert at Albert Hall in which Day suddenly realizes what is about to occur. Without giving away some of the intricate plot twists and turns, The Man Who Knew Too Much is like a breathtaking ride on a state-of-the art roller coaster. You cannot help but get caught up in the plight of Stewart and Day. James Stewart and Doris Day seem like a real married couple, so easy and comfortable is their on-screen chemistry. They banter and interact convincingly, but there is also a strong indication that there may be some tensions lurking beneath the outer veneer. Both actors play their roles with expertise and Day, in particular, shows range and versatility in her performance, being especially memorable in the justly celebrated Albert Hall scene and in an earlier scene when Stewart sedates her before he informs her that their son has been kidnapped. The growing realization as to what he is telling her is reflected in Day’s facial reactions. Hitchcock has once again assembled a first-rate cast of supporting players, including his long-time musical collaborator, Bernard Herrmann, who appears on-screen for the first time, playing himself while conducting an original piece of music during the Albert Hall sequence. The team of Livingston and Evans composed a song for Day to sing to her son as part of the plot. The tune, Whatever Will Be, Will Be (Que Sera, Sera), became a mega-hit, selling millions of records, winning an Oscar as best song and becoming one of Day’s signature tunes. It plays an intricate role in the storyline, being introduced naturally and being reprised as part of the picture’s denouement. 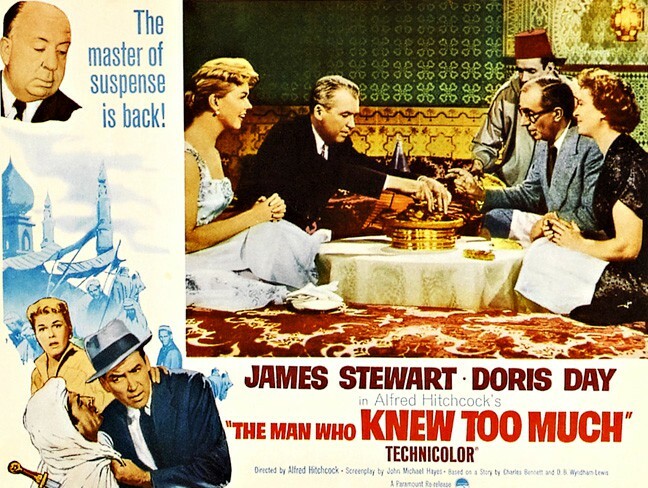 The queues that formed at box offices all over the world when The Man Who Knew Too Much opened in the summer of 1956 were a tribute to the talents of Hitchcock, Day, and Stewart, and to the public’s continuing fascination with quality entertainment. 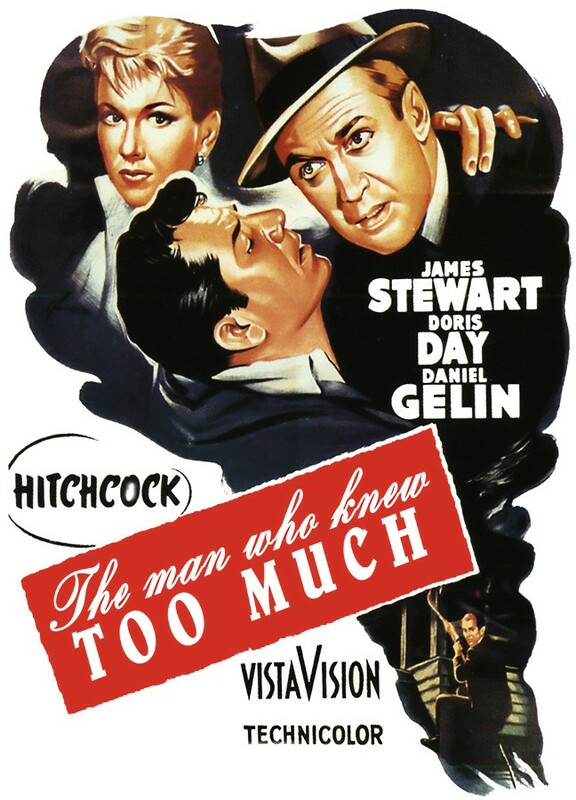 To this day, the film remains one of Hitchcock’s best films from his 1950’s period. A movie that is well worth viewing. 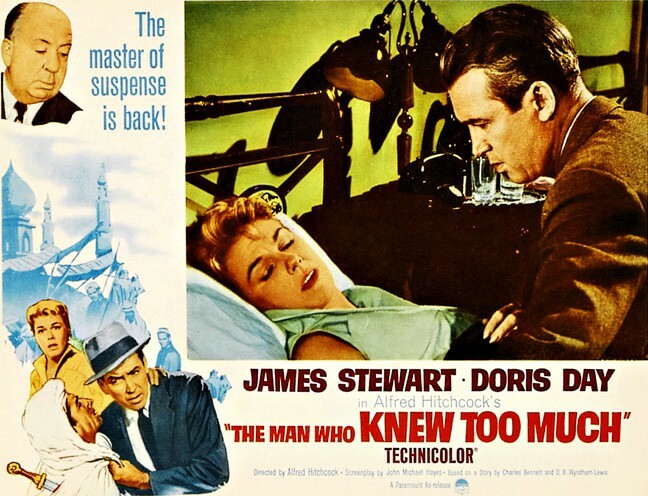 Hitchcock suspense, graduated excitement, calculated horror, all of the old master’s bag of tricks, plus Jimmy Stewart and a notably fine dramatic performance by Doris Day, all smoothly blended, carefully baked to a turn and served with a flourish, make this a tasty box office dish. The Alfred Hitchcock magic is simple – any casual observer of his style can tell you what’s coming next, but it retains its captivating charm because the rabbit keeps appearing in the most unexpected places. 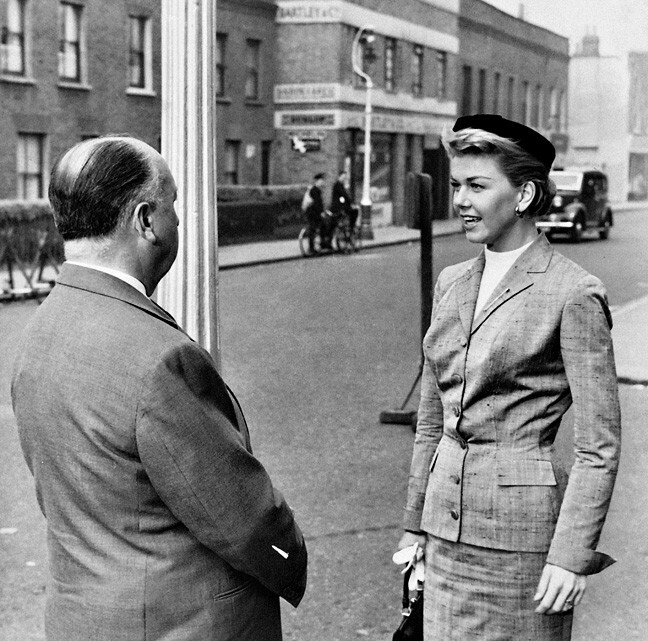 The Man Who Knew Too Much, London filming, Alfred Hitchcock and Doris Day. 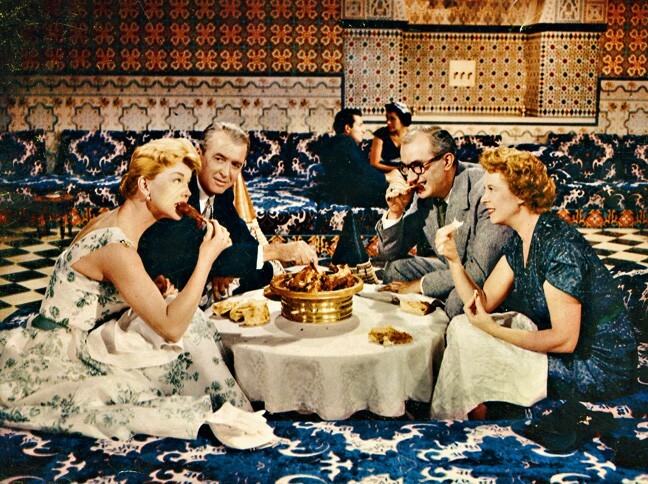 Doris Day traveled to two major locations during the filming of this suspense film – London and Marrakesh in North Africa. She loved her visit to London and even commented later that if she didn’t have her pets she’d probably live in London. Doris Day gives her autograph to a young boy in London. Doris Day, James Stewart, Bernard Miles and Brenda de Banzie. From there she was transported to Marrakesh and it was an entirely different story. 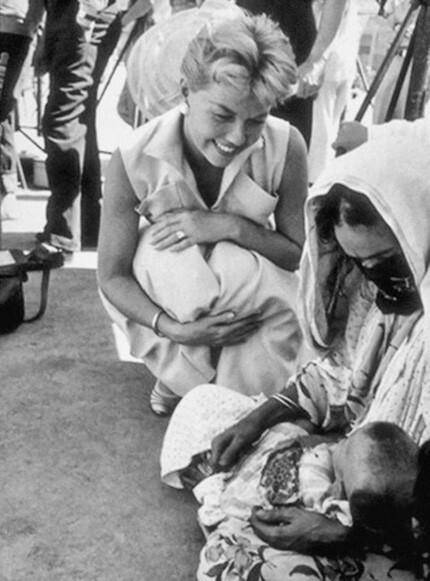 Doris Day on location in Marrakesh for The Man Who Knew Too Much. 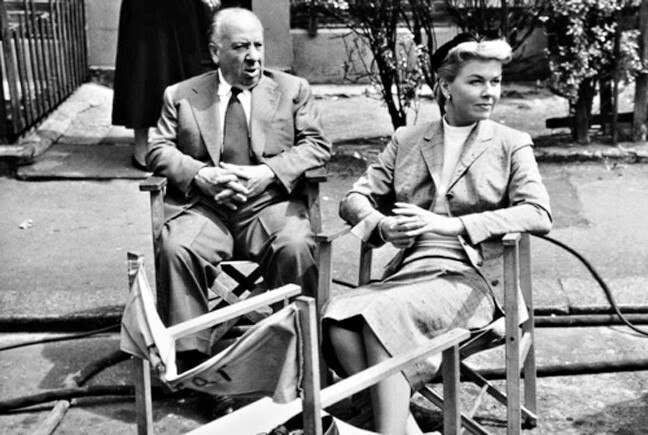 The Man Who Knew Too Much, London street filming, Alfred Hitchcock and Doris Day. The London Symphony Orchestra and the Covent Garden Chorus make a dramatic personal appearance in this film. Conducted by Bernard Herrmann, the 350-voice choir sings Storm Cloud Cantata, in which a titanic crescendo of clashing cymbals and rolling drums is used as a cover for a political assassination in London’s Albert Hall. Alfred Hitchcock once told François Truffaut that his 1934 version of this exciting thriller was “the work of a talented amateur and the second was made by a professional”. There’s no doubt that this color remake is technically more accomplished while the deft tinkering with the finale adds considerably to the suspense. But not all of the additional 45 minutes are as well spent.